Oscar Pistorius finishes second in his heat and will race in Sunday night's semifinals. LONDON — It began with a smile at the starting line. 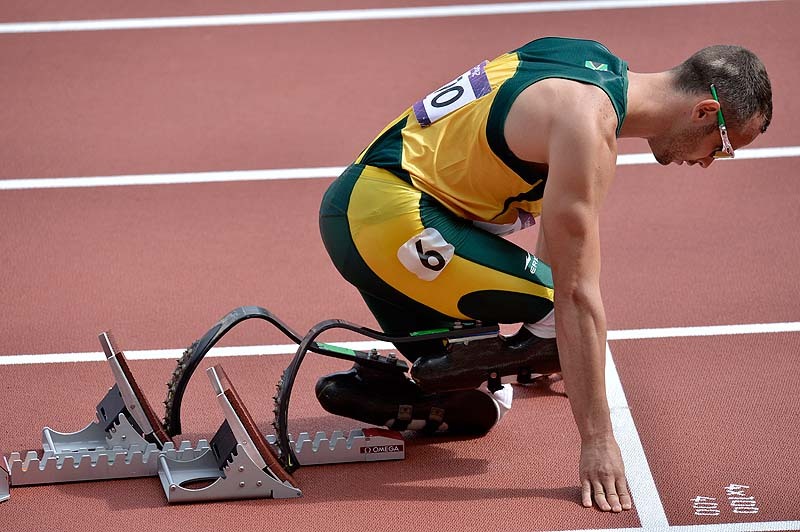 Moments later, Oscar Pistorius took off and the click-click-clicking of carbon on the track was all but drowned out by the 80,000 fans on hand to watch him make history Saturday. The first amputee to compete in track at the Olympics, Pistorius cruised past an opponent or two in the backstretch of his 400-meter heat, and by the end, the “Blade Runner” was coasting in for a stress-free success. Yes, this sun-splashed day at Olympic Stadium was a good one for Pistorius, a double-amputee who runs on carbon-fiber blades and whose fight to get to this point has often felt more like a marathon than a sprint. He walked out of the tunnel, looked into the stands, saw his friends and family there — including his 89-year-old grandmother, who was carrying the South African flag. “It’s very difficult to separate the occasion from the race,” Pistorius conceded. But he figured it out. He finished in a season-best time of 45.44 seconds, crossing the line and looking up at the scoreboard, then covering his face with his hands when he saw the capital “Q” — for qualifier — go up by his name. “Couldn’t have hoped for anything better,” he said. The 25-year-old runner was born without fibulas and his legs were amputated below the knee before he was a year old. His is one of those stories that is every bit as much about the journey – one part dramatic, another part inspiring and yet another part controversial – as the final result. Pistorius has four Paralympic gold medals, but this latest trip around the track is about something different. After dozens of hearings in front of hundreds of men and women in suits charged with the task of deciding whether the blades gave Pistorius an unfair advantage – then getting his country’s Olympic committee to accept his qualifying times and enter him into the games – Pistorius finally got his chance. He shook hands with his opponents, crouched into the blocks, flashed that smile and then – in so many ways, it was just another race, with Pistorius among the fastest men in it. “I just see him as another athlete, another competitor,” world champion Kirani James said. Bursting out of the crouch from Lane 6, Pistorius got going slowly, but built up steam in the backstretch. He made up the lag and was easily among the top three when the runners turned into the backstretch. He passed Russia’s Maksim Dyldin and then, as all the top runners do in a 400 prelim, let off the gas over the final few meters to save energy for the next one. Though he knows his personal-best of 45.07 seconds isn’t fast enough to truly contend for a medal, Pistorius wants to be more than simply a set piece at these Olympics. His goal was to be a factor, to earn a spot in the semifinals, and he did that – something the defending champion in this event, LaShawn Merritt, did not. “He’s fought to get here. He’s here. Great guy, friend of mine,” said Merritt, who pulled up lame with an injured hamstring halfway through his race and won’t get to face Pistorius on the track. One man who might, Britain’s Nigel Levine, is among those who sounded less than thrilled about all the hype over Pistorius, who will also compete for South Africa in the 4×400-meter relay next week. Advantage or no, getting to the semifinals was never a sure thing. Then again, there haven’t been many sure things for the “Blade Runner” on this Olympic road. And so, he appreciates every moment.